A late Darren Bent penalty gave Charlton a precious - and barely deserved - three points against Wigan. Wigan dominated a tight game, with Lee McCulloch and then Caleb Folan twice going close to breaking the deadlock. But Charlton won a spot-kick when Marcus Bent and Hermann Hreidarsson were fouled in the 85th minute. Wigan keeper John Filan got a hand to Bent's spot-kick but he was unable to keep it out and the Addicks moved to within a point of safety. Until Bent's dramatic penalty - which the visitors strongly contested - Charlton had hardly tested the Wigan backline. But the win gives Alan Pardew's resurgent side a huge boost in their battle against the dreaded drop and drags Paul Jewell's Wigan well into the relegation scrap. Prior to the late drama the Addicks had shown a disappointing lack of ambition with Darren Bent - fit to start after missing out for England - finding himself alone and isolated up front. Wigan, on the other hand, were much more positive from the kick off, although they were limited to mainly half-chances. Lee McCulloch shot over the bar and Emile Heskey was denied the 100th league goal of his up-and-down career by a good challenge from Talal El Karkouri in the opening half hour. Folan was then denied by Scott Carson and Matt Jackson headed over from one of Ryan Taylor's numerous set-pieces. 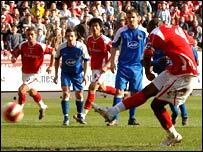 Charlton could only muster an instinctive volley from Matt Holland and a Jerome Thomas shot wide of Filan. After the break McCulloch almost capped his 200th game for the club with a goal when he slid in to try and finish a Folan cross, but just could not direct it on target, while Leighton Baines flashed a long-range effort just wide. Folan had two efforts of his own, but the first was blocked by Luke Young and then he drilled well over. There looked to be just one likely winner until a frenetic last 10 minutes saw referee Peter Walton pointed to the spot after substitute Marcus Bent and Hreidarsson had gone down in the area under challenges from Fitz Hall. Bent's 13th of the season ended Wigan's run of 422 minutes without conceding. Jewell, who is already facing an FA charge for comments about referee Phil Dowd, had some strong words for Walton at the full-time whistle. "I think it was a tough call but it was that kind of game. "With the roll we are on and the good feeling in the stadium it was a big moment for the referee and sometimes they go your way. "Wigan worked us hard but we kept going and sometimes you earn your breaks. "We didn't play great today but our fans carried us through. We've given ourselves a great opportunity and our destiny lies with ourselves now." "It is hard to take. It was a very scrappy game between two very nervous teams and one goal was always going to be vital. "I thought we had the better of the play, certainly in the first half. "The game was low on quality but the way we lost was doubly disappointing. "If that is a penalty there would be 50 penalties in a match." Charlton: Carson, Young, El Karkouri, Diawara, Hreidarsson, Rommedahl (Marcus Bent 46), Holland (Ambrose 71), Song Billong, Thomas, Zheng, Darren Bent, Ambrose (Faye 87). Subs Not Used: Randolph, Bougherra. Goal: Darren Bent 86 pen. Wigan: Filan, Hall, De Zeeuw, Jackson, Baines, Taylor (Valencia 72), Landzaat, Skoko (Scharner 76), McCulloch, Folan, Heskey. Subs Not Used: Nash, Kilbane, Unsworth.